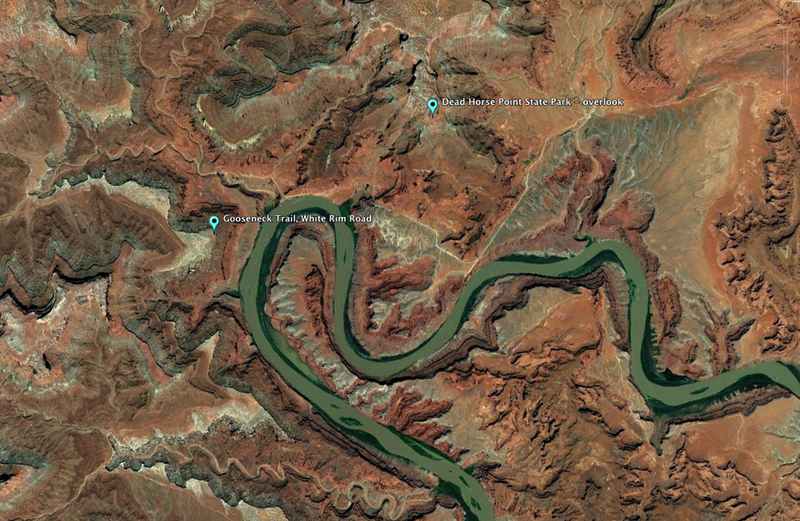 The Gooseneck is a sharp bend in the Colorado River about 13 miles west southwest of Moab, Utah. At Dead Horse Point State Park, there is a fine view of the surrounding terrain from the mesa above, and closer views of the Gooseneck are afforded from the White Rim Road and Schafer Road down in the canyons carved by the River. Dead Horse Point and the Gooseneck from the northeast, at the overlook at Dead Horse Point State Park. The point of view of the image below is indicated by the blue arrow. From the northwest side of the Gooseneck, down on the White Rim Trail. The point of view of the image above is indicated by the blue arrow. From 37,000 feet, the relative positions from which the two photos above were taken. Link. Published on August 05, 2012 by Mark Johnston. I always wanted to see this well-known photo destination. Given its popularity, I thought I would get there early to make sure I had a good vantage point for some photos. So I got up in time to be at the entrance when the Dead Horse Point State Park officially opened at 6 AM. It was about a 40-minute drive from downtown Moab, in total darkness. There was nobody in the gatehouse when I arrived at the park entrance, so I put my ten dollar entrance fee in the provided envelope and dropped it in the designated slot, then drove to the parking lot at the end of the point. I need not have worried about beating the crowd - the place was desolate. Fifteen degrees Fahrenheit and a bit windy, and still pitch black. So I grabbed the flashlight and walked across the dry layer of crunchy snow to the overlook. Couldn't see a damned thing - just a void between the line of rosy light along the southeastern horizon in the distance and wall marking the boundary of the overlook. So I went back to the car and rewarmed until there was enough dawn light to try again. I still couldn't see the shape of the land below from the overlook, but the camera could. So I took a couple of long exposures to figure out where to point the camera for the composition I wanted. Hope you like the photo - waiting until the sun rose high enough to kiss the top of the point, I froze my @ss off to get it! Dawn at Dead Horse Point. Link. Published on December 24, 2011 by Mark Johnston.